When there’s extreme weather – from storms to droughts – your bunkers really show it. The key to better performing bunkers is moisture control. As soon as the sand on steep bunker faces starts to dry out, the risk of plugged ball lies and washouts increase significantly. The Capillary Concrete Bunker System gives you total drainage control and keeps bunker moisture at optimal levels to eliminate washed out bunkers, soil contamination, plugged ball lies and other bunker maintenance and playability problems. 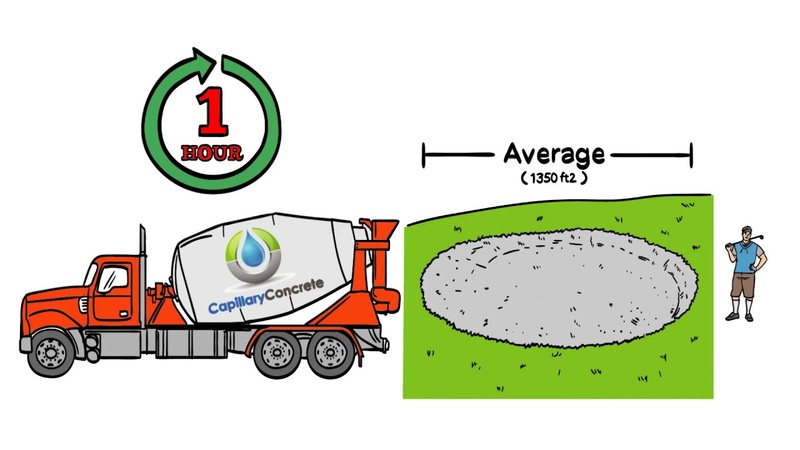 Capillary Concrete not only rapidly drains rain from storms, it moves moisture back up to the bunker sand during drier weather through special micropores and capillary action. The patented Capillary Concrete system stores and restores moisture to the sand faces to provide more ideal playing conditions. In addition, we are the only product on the market that get a 1000 psi rating in ASTM testing protocols, and can withstand severe climates and frozen ground. No other product comes close to this rating. Our bunkers last longer, pay for themselves within three years, and provide better, more consistent player experiences. We are so confident in the performance our bunkers that we offer a 10-year unlimited Financial Guarantee. Turn your bunkers into an asset instead of a financial liability with our flexible and convenient Financial Solutions. Capillary Concrete is environmentally friendly and completely safe for installers and players, and can be used in sensitive wetland areas without any problems. No leaching and no dangerous hardeners or solvents are used.